The remains in the living district included two house foundations, 161 tombs, 80 ash pits, seven wells, three ash trenches and one road. According to the stratigraphy and the unearthed artefacts, these remains could be divided into two phases, the middle and the late Liangzhu cultures. F8 was a well-preserved house foundations dating to the Liangzhu culture and covered about 18 square meters. And the rectangular foundation trench could be divided into a big and a small room whose doorways were in the same side and next to each other. In addition, posts were placed next to the doors. The excavated tombs were laid in east-west direction and had rectangular shaft earth pits. The human bones in the tombs were rotten and the traces of coffin still preserved in some tombs. The pottery assemblage in the tombs dating to the middle Liangzhu culture were ding 鼎tripods, dou豆 plates, guan 罐jars and pen 盆basins. The pottery assemblage in the tombs dating to the late Liangzhu culture were ding 鼎tripods, dou豆 plates and zun 尊, and filters, ring-foot trays, double-noses kettles, wide handle cups etc. However, stone yue 钺axes did not co-exist together with pottery spinning wheels，which probably reflected the gender difference. Some tombs had more yue 钺axes buried, for example, there were 24 yue axes in M79 and there were up to 27 yue axes in M133. In addition, the types of buried jades included the trifurcate-shaped objects, crown-shaped objects, huang 璜 pendents, bracelets, conical-shaped objects, zhui 坠pendents, guan 管 pipes, beads and string decoration, etc. In the 850 square meters area in the east district of the site, a watercourse (G7) in northwest-southeast direction leading to the north living dxistrict, was across in the middle. On both sides of G7, blocks of rice fields were distributed. Totally there were 26 blocks of rice fields and two wells discovered. The shapes of the rice fields were strip, irregular and rectangular shape, and their areas covered from 1 or 2 square meter to 30 or 40 square meter. Between the rice fields were small grooves which connected the rice fields and some rice fields had irrigation and drainage watercourses which connected to G7. From the wells and G7 within the rice fields area which dated to the middle Liangzhu culture, there were potteries, including ding 鼎tripods with fin-shaped feet, double-nose kettles, plates with ring foot, and stone knives unearthed. On the east side of G7, a canoe with point front end and square tail end was found. It was 7.35 meters long, 0.45 meters wide at the widest part, 0.23 meters deep, and the gunwale was about 0.02 meters wide. This canoe was made of a whole Pinus massoniana log and incomplete in some parts of it. This is the first time to find a canoe dating to the Liangzhu culture, and the canoe is the best-preserved longest unearthed one in the prehistory China so far. Eleven blocks of rice fields and one watercourse in east-west direction were discovered during the trench excavations in the south rice field district of the west part of the site. Some blocks of rice fields were overlapped. According to the above, it was presumed that a large area of rice field had been formed in the over 700 square meter area in the south part of the site during the middle Liangzhu culture. The shapes of the rice fields were small blocks scattering all over and small watercourses crisscrossing distributed among the rice fields. The rice fields dating to the late Liangzhu culture: an east-west watercourse (G2) was dug between the higher ground living district and the low-lying rice fields during the late Liangzhu culture. G2 was supposed to cross the entire Maoshan site from west to east. Moreover, G2 was functioned as flood control and drainage, supplying living water, irrigating the south rice fields, etc. So, the construction of G2 showed that the settlement had been better planned and laid out during the late Liangzhu culture. In addition, four blocks of rice fields dating to the late Liangzhu culture were encircled by the irrigation water channels and field ridges. Their shapes were strips in south-north direction and their areas were usually 1000 square meter and the largest one was near 2000 square meter. 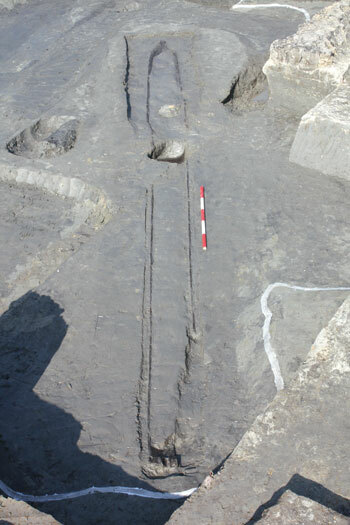 An east-west watercourse (G2), which could be corresponded to the one in the east part, was also discovered in the trench excavations in the south rice fields located in the west part of the site. In addition, there were one irrigation channel (G3) in the north part of the site and four field ridges paved with burned brown clay in south-north direction. According to the result of analysis of soil phytolith and plant seeds, the rice fields dating to the late Liangzhu culture were distributed in strips in east-west direction. They were over 700 meters long in east-west, 45-110 meters wide in south-north and covered about 5.5 ha. The cultural deposit in the living district was thin and the remains included five ash pits and one well. While, the unearthed relics included potteries, such as flat-feet ding 鼎tripods, guan罐 jars, dou 豆plates, and crescent-shaped stone knives, etc. The sixth stratigraphy layer in the rice field was a farming layer dating to the Guangfulin culture and covered a large area. Several harvesting tools—crescent-shaped stone knives were unearthed from this layer. In addition, the analysis to the soil phytolith and plant seeds from this layer showed that rice had been planted. Moreover, fifty hoof prints were newly discovered on the surface of this farming layer in the east part of the Maoshan site. 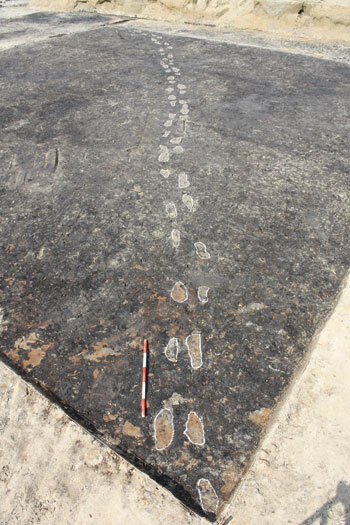 They belonged to the same group as those (thirty hoof prints) discovered in the first phase excavation. Another seventeen hoof prints were discovered on the same layer’s surface in the southwest rice field district. The settlement at the Maoshan site dating to the Liangzhu culture was composed of the living district, cemetery and rice field district. Its layout is clear and complete and is a new breakthrough for studying the settlements during the Liangzhu culture. It is the first time to find the strip-shaped rice field dating to the middle Liangzhu culture and the large area of rice field dating to the late Liangzhu culture. Moreover, the large area of rice field dating to the late Liangzhu culture disclosed clear road system, irrigation system and completely strip-shaped field structure. These are a new type of prehistory agricultural materials in the lower reaches of the Yangzi River. Also they are the best-preserved rice field remains with the most complete structure during the Neolithic period. They are significant for studying the settlement, rice farming during the Liangzhu culture and further studying the role of the Liangzhu culture in the origin of Chinese civilization.